What are you saying to parents interested in your child care center to build that relationship of trust and get them to enroll? The power is in the message and the key is to make the marketing message about them, not about you! Yet, I see child care owners fail at this over and over again. 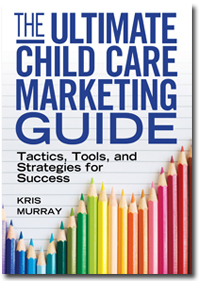 The other day I signed up to be on the email list of a child care center, since the owner is a client of mine in the Child Care Success Academy and I like to keep tabs on my clients to know how they are marketing :-). I signed up for her list through an opt-in form on her website. Thank you so much for your interest in XYZ Academy. We believe we are among Springfield’s finest early education programs and can meet, if not exceed, all your child care needs. We understand your choice of child care is a very personal and important decision. I will be contacting you within the next couple days to answer any questions you may have and to arrange a time to visit us at your earliest convenience. In the meantime please feel free to contact me for any information. Are you wondering what the problem is with this email? The second sentence starts with “We believe that we are….”. Well, of course you do, it’s your child care business! The key is to have parents and teachers tell the message and story of your child care center for you, in a way the prospective parent can relate. Your emails shouldn’t be coming from your perspective, talking about your wonderful child care. An effective message needs to be readjusted to, “We want to serve you. Here’s how you will benefit. Here are testimonials and quotes from Springfield families.” This is a message that is more centered on the prospect. They can easily relate to it because the story is coming from other parents like them. 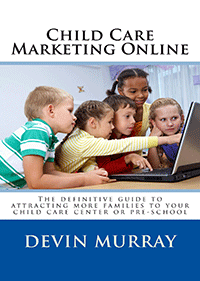 “Do you need help growing your enrollment and revenue, managing your child care business more effectively? If so, you’ve come to the right place.” That’s four times that I used the word “you”. “We” and “I” aren’t in there once. When you use this technique, the reader will identify with the message. They’ll understand that this business was created and tailored for them. Using this sort of language will allow you to speak in a more targeted way, identifying the perfect customer that needs what you have. 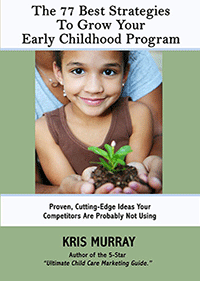 Your prospect doesn’t care if you think you have the finest child care. They just want to know what’s in it for them. Action step: Take a look at the messaging on your child care website, your email, brochures, signage, and every other marketing message and think about how many times you use we vs. you. Use testimonials to communicate what makes your child care different and unique instead of it coming from you. That is a powerful message that should be at the top of your marketing. Take some time to flip your message to be prospect focused and make it about them, not about you. Let this be your next step in running a more successful child care!